My household along with a lot of other households with children is going through a Pokemon craze. It started with the cards last year, then the cartoons. It’s so bad that even my 2 year old is obsessed. It’s all about Pokemon and Pikachu! Showing my age now – but honestly what is this show about?? Recently though, a Pokemon App is taking the world by storm – Pokemon Go. Some people are saying how great it is to have children play this game because it encourages kids to get out – even if it is in an alternative reality of catching Pikachu. At least they’re not inside. My son, like many boys his age wants to play this, but I have to say a clear ‘sorry’ to my son. I am not one of those mums that will allow their young child to play this game. I’m afraid my dear son, I am never going to be a ‘cool’ mum. You my son will likely miss out on being ‘cool’ like your friends for years to come, because after Pokemon Go, there will be many more silly fads which will come and add nothing to your development intellectually, emotionally or physically. You’ll likely ‘hate’ me and ridicule me to your friends and roll your eyes at me (he’s already started doing this! ), but I’m willing to wear that. My husband says that I have to ‘ease up’ and that I can’t keep him away from these sorts of games and devices forever. To that, I say maybe not, but he’s 8 years old and I would rather have him read, draw, ride a bike, than walk around staring at a phone trying to catch Pikachu. While this App may help to get kids out, I find it sad to see young kids out, mobiles in hand staring at their screens. While there are many brains working right now on how to harness Pokemon Go for the greater good of protecting nature, I think having a love of nature yourself is the best way to create these values in your children. Get out yourself and get into nature. Talk about it and feel connected to it. Even if you don’t live near bushland or a beach – find a pocket of trees, grass, a communal area, plaza – whatever it is, get out there and have fun with it yourself, despite the limited time you might have. The connection to nature is disappearing. With more people living in cities and cities becoming denser and nature being taken out of cities – it is harder to get to nature and hard to feel connected to it. With the earth facing the next mass extinction episode, we need to get back to nature. Nature provides everything to us – water, air, materials. Even the ones that fuel our lights, the materials that go into our devices, the materials that we wear and build with – it originates from the earth. I am often saying to my husband to get out into the garden and potter around, because if he does, my son eventually leaves his room and follows. It is their personal preference to be inside with toys, but getting both boys in my life outside is my mission and I hope not to rely on Pikachu to do that! I’d love to hear your thoughts. Am I being too tough? Any day now, the earth will pass a new milestone. Far away from where most of you live, but not so far from me, in a remote location of Tasmania, Australia, there is a place called Grim Point. For decades now, scientists at Grim Point have been collecting air quality data, which includes concentrations of carbon dioxide in the air. Well the latest record related to our atmosphere that we are breaking, is that for the first time in recorded history the concentration of carbon dioxide in the air has reached 400 parts per million (PPM). Why is this so significant? Mostly, because it is so remote, it is said that Grim Point has the world’s cleanest air. Hence this new milestone is being seen as a point of no return for humanity. For non-scientists, parts per million is a measure of the concentration (mass) of a chemical in water or in this case, the air. So for example the 400 ppm means for every 1 million gas molecules in our atmosphere, about 400 are carbon dioxide molecules. It’s important to note that as well as the carbon emissions continuing to go up, every day there are stories about the earth heating up. This month another record has been broken – the warmest April on record. That’s seven months straight of record warm global temperatures. 2015 was the warmest year in recorded history also. Some people might think – yippee, endless summers and hey, I like summers like the next person, but when I hear that the the coral in the Great Barrier reef is bleaching and that Greenland ice sheet has started to melt early this year (http://www.smh.com.au/environment/greenland-ice-sheet-melting-has-started-early-20160429-gohx1z.html) I start to think hold on, all of this is very troubling and is pointing to an uncertain future if we don’t start seriously looking at carbon emissions. What is a safe level? Before the burning of coal, the concentrations of carbon dioxide in the air was measured at 275 ppm. The organisation 350.org however states that 350 ppm is a safe level of carbon dioxide in the atmosphere. This would equate to 1 degree global temperature increase. These new milestones were discussed on the radio the other day and lo and behold, there was a climate change sceptic on the radio and while I agree that we need to have a balanced view, I couldn’t get over the arguments put forward about whether there is any proof that carbon dioxide emissions are changing the earth’s climate. Despite the many many scientists that acknowledge that carbon emission are altering the earth’s atmosphere resulting from the burning of fossil fuels, there are some that refuse to believe the facts. It also annoys me that we still have to going to the lowest base as far as discussions are concerned. Rather than getting on with it, we have to keep arguing the facts and justifying any action at all! I recently watched a documentary called Ice and the Sky / La Glace et le ciel (2015). This documentary follows Claude Lorius and his many expeditions to the south pole to study glaciers. During his studies he put forward a theory that the glaciers were able to tell us about the earth’s climate because they had layers similar to tree rings. He was also able to see that the air bubbles caught in the ice sheets were the fossil remains of the earth’s atmosphere, so he began studying them. The story is a great one – through his studies and ever bigger machines he was able to dig deeper and deeper into glaciers and what he was able to see was the correlation between carbon dioxide emissions and the length of warm and cold periods. He was able to go back 800,000 years and his conclusion was the proof that carbon dioxide emissions were related to global temperatures. I don’t want to give away more than that, but really recommend the documentary. If you want to know more about the science behind how this important discovery was made, then please watch it. You could even sneak it in as viewing to any climate change sceptics that you know. Apart from getting into the nitty gritty of the science of climate change, we can all do our bit to help get carbon emissions down to 350 ppm. The mantra of ‘Think global, act local’ really can make a difference. If we do our part, collectively we can make a difference. If you can, install solar panels and make your own energy! Check out your local Council for any local action groups. Keep up to date with what organisations like 350.org (http://350.org/) Greenpeace (http://www.greenpeace.org/australia/en/) World Wildlife Fund (http://www.wwf.org.au/) or Australian Youth Climate Coalition (http://www.aycc.org.au/) and spread the word. Talk to colleagues, your family or neighbours. Contact your local Council to see what they’re doing to address climate change. Are they making considerations of climate change risks in how they plan developments and how they design and construct stormwater systems for example? For those in Australia, contact your state or local MP to see what their policies are in relation to climate change. There’s an election on right now and scant discussion about this very important topic. I was never much of a coffee drinker until fairly recently. I never liked the taste – not really through university and not really in my earlier days of working. At the moment however I enjoy a cup of coffee a day. It’s more the habit of it that I enjoy. I like taking the time out to prepare and drink it. My husband on the other hand is a coffee drinker from way back. Every day without fail he’ll have a cup at about the same time. Over the years the standard of coffee drunk has increased. From the instant coffee to buying his own beans, grounding it and using various methods to extract the coffee. When we moved to the UAE, he bought a cappuccino maker. We felt very fancy. Then it broke and after some reading I bought him a better one for Father’s Day one year. He broke it! then I arranged to get it fixed – then he broke it again and again! In the end we had to get rid of the cappuccino maker. When we moved back, we managed to acquire my sister’s cappuccino maker – which my husband promptly proceeded to break. So after that I had to put my food down and say no more cappuccino makers. This happened to be about the time that the coffee pod machines became super cheap and stores like Aldi started to sell the pods very cheaply too. Despite my reservations my husband bought one and thankfully in a way he’s managed to not kill the machine. Except that every time we made a cup of coffee it was filled with guilt. Guilt about all the pods we were throwing in the bin. The plastic that was never going to degrade and the mountains of coffee pods that must surely be filling up landfills. Australians are consuming about three million pods a day. More than 1.5 million households in Australia own a pod machine, a number forecast to double by 2018 with reports the capsule coffee market is on track to overtake the grocery bean market. Lately we’ve justified the use of our machine because there is a recycling point in Lane Cove. 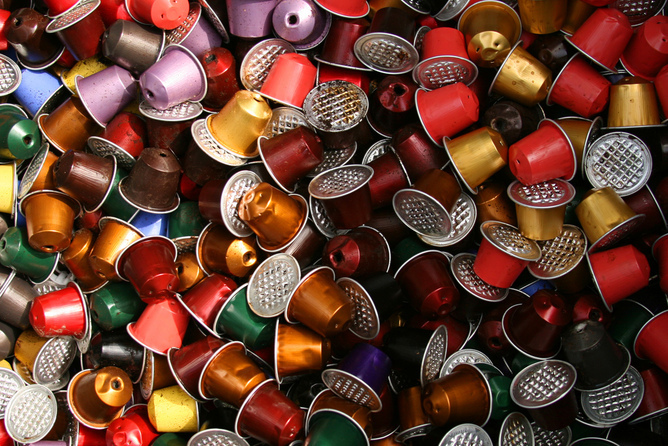 While this is better than disposal, the multiple layers of plastic and aluminium used means that it is in fact very difficult to recycle coffee pods and in many cases unless the aluminium pods are collected by TetraCycle who have specialist way of collecting and recycling the pods, they are not recycled at all. Certainly the plastic pods are not recyclable, therefore end up in landfill. Then there is the compostable or biodegradable coffee pods. These are a lot more expensive than the average coffee pods and again there is no simple way of throwing them in your compost bin and hoping for the best. You need a special commercial composter to compost them. If they’re thrown in the bin in the hope of biodegrading in landfill they end up emitting methane – a very powerful greenhouse gas. In short, the whole thing stinks and with 3 million pods being used every day, it doesn’t take much of an imagination to see that this is big problem. About six months ago though I decided that enough was enough. Being an eco-mum, I wasn’t just concerned about what to do with the pods afterwards. My concern was about the use of resources to manufacture the silly pods in the first place. So I decided to go back to the way coffee is made in other countries like the Middle East and Italy – using the Moka Pot. This is a stove top coffee maker where water boils in a lower chamber and the steam creating pressure that then passes the vapour through the coffee to an upper chamber. It’s kind of like magic really! I bought myself one of these pots along with organic fair trade coffee. The results have been good. Taste wise I like it and I especially like the process and the aroma that drifts through the house. Time wise- it does take longer, but from a waste and materials use point of view it really is the way to go. Especially as I compost all my coffee grinds and apply that on my vegetable patch. My husband on the other hand remains unconvinced. He swears that he likes the taste of the coffee pod machine more and while he’s usually very supportive of my eco-ventures. This is one where he is standing his ground – excuse the pun! I on the other hand will continue to put forward the case that our house needs to be a pod free house. I urge the millions in Australia and beyond to follow suit. With the new year just recently started, I ask everyone to make a pledge for the planet and enjoy a guilt free cup of coffee and if you make the pledge try and convince someone else to do it too! It’s that time of year again. Time has flown and it’s Christmas gift time. As usual, I am going with the theme of my children making gifts for family. This teaches them to look beyond the commercialisation of this time of year, and to express their love for family by transforming regular household items into items of beauty that I’m sure their family will treasure. The last few years we’ve made edible goods. This year I decided to do something different. One day when I was looking at old jars, I decided to start collecting them to upcycle them by reusing them rather than recycling them. This started my plan many months ago to make terrariums for family members using old jars. A terrarium is essentially a jar with a plant growing inside it. It can either have a lid and be sealed, or it could be open. Those with lids create a mini ecosystem in that evaporation forms condensation which ends up watering the plant. Many plants can be planted in a terrarium, from decorative plants, to succulents. As I was using reused glass jars, I decided to have an open terrarium and use existing succulents I had around my garden. So how to get started and what do you need? Place the pebbles at the bottom of the jar to about 2 cm. This helps with drainage and to keep your plants healthy. I added some extra coloured pebbles and going with the Christmas theme, I had green, red and silver. I cut a small bit of cloth (I used an old reusable cloth bag) and put over the pebbles before adding the soil layer because I didn’t want the layers to mix much. I added some activated charcoal then the soil. The activated charcoal acts to keep your terrarium fresh and stops any bad odours. Pat the soil down to prevent air bubbles. I then added my plants. As my jars were small, I only used 1 to 2 plants per jar. I added some more decorative pebbles on top and viola – done! The terrarium needs to be lightly watered through a sprayer about once a week, so it should be low maintenance. My children were involved in all aspects of this activity, from choosing the colours and order of the layers, to selecting the plants to the actual plants. I know that they’re going to be so proud to give this to their family. You are currently browsing the Trying to be an eco-mum on a budget weblog archives.